For fighting between insurgent groups, see Sectarian violence in Iraq (2006–07). * "injured, diseased, or other medical": required medical air transport. UK number includes "aeromed evacuations"
** ਕੁੱਲ deaths include all additional deaths due to increased lawlessness, degraded infrastructure, poorer healthcare, etc. ↑ 2.0 2.1 "The JRTN Movement and Iraq's Next Insurgency | Combating Terrorism Center at West Point". Ctc.usma.edu. Retrieved 2014-08-02. ↑ Michael Petrou (9 September 2011). "The decline of al-Qaeda". Maclean's. George W. Bush gambled on surging thousands more troops to the embattled country. It paid off. Al-Qaeda in Iraq is now a diminished force without territory. ↑ "Iran expands regional 'empire' ahead of nuclear deal". Reuters. ↑ "How to Stop Iran's Growing Hegemony - National Review Online". National Review Online. ↑ "Al-Qaeda's Resurgence in Iraq: A Threat to U.S. Interests". U.S Department of State. 5 February 2014. Retrieved 26 November 2010. ↑ Elaheh Rostami-Povey, Iran's Influence: A Religious-Political State and Society in its Region, p130-154, Zed Books Ltd 2010. ↑ "Operations By Iran's Military Mastermind - Business Insider". Business Insider. 9 July 2014. ↑ "A Timeline of Iraq War, Troop Levels". The Huffington Post. ↑ "Deputy Assistant Secretary for International Programs Charlene Lamb's Remarks on Private Contractors in Iraq". U.S. Department of State. 17 July 2009. Retrieved 23 October 2010. ↑ Pincus, Walter. "Violence in Iraq Called Increasingly Complex". The Washington Post, 17 November 2006. ↑ "Iraq War" (PDF). U.S. Department of State. Retrieved 18 November 2012. 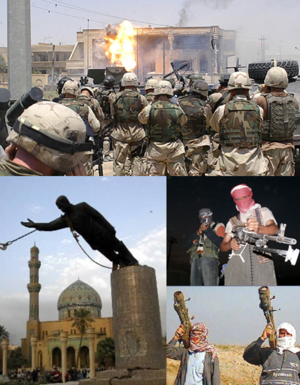 ↑ 23.0 23.1 "Operation Iraqi Freedom". iCasualties. Retrieved 24 August 2010. ↑ "Casualty" (PDF). Retrieved 29 June 2016. ↑ "Fact Sheets | Operations Factsheets | Operations in Iraq: British Fatalities". Ministry of Defence of the United Kingdom. Archived from the original on 11 October 2009. Retrieved 17 October 2009. ↑ "POW and MIA in Iraq and Afghanistan Fast Facts". CNN. Retrieved 5 June 2014. ; As of July 2012, seven American private contractors remain unaccounted for. Their names are: Jeffrey Ake, Aban Elias, Abbas Kareem Naama, Neenus Khoshaba, Bob Hamze, Dean Sadek and Hussain al-Zurufi. Healy, Jack, "With Withdrawal Looming, Trails Grow Cold For Americans Missing In Iraq", The New York Times, 22 May 2011, p. 6. ↑ "Casualty" (PDF). U.S. Department of Defense. Retrieved 18 November 2012. ↑ 32.0 32.1 iCasualties.org (was lunaville.org). Benicia, California. Patricia Kneisler, et al., "Iraq Coalition Casualties"
↑ 33.0 33.1 "Defence Internet Fact Sheets Operations in Iraq: British Casualties". UK Ministry of Defense. Latest combined casualty and fatality tables. Archived 14 November 2006 at the Wayback Machine. ↑ 35.0 35.1 "Office of Workers' Compensation Programs (OWCP) – Defense Base Act Case Summary by Nation". U.S. Department of Labor. Retrieved 15 December 2011. ↑ 36.0 36.1 T. Christian Miller (23 September 2009). "U.S. Government Private Contract Worker Deaths and Injuries". Projects.propublica.org. Retrieved 23 October 2010. ↑ 185 in Diyala from June 2007 to December 2007, 4 in assassination of Abu Risha, 25 on 12 November 2007, 528 in 2008, 27 on 2 January 2009, 53 From 6 to 12 April 2009, 13 on 16 November 2009, 15 in December 2009, 100+ from April to June 2010,  52 on 18 July 2010,  ਕੁੱਲ of 1,002+ dead Archived 18 April 2009 at the Wayback Machine. ↑ Moore, Solomon; Oppel, Richard A. (24 January 2008). "Attacks Imperil U.S.-Backed Militias in Iraq". The New York Times. ↑ Greg Bruno. "Finding a Place for the 'Sons of Iraq'". Council on Foreign Relations. Retrieved 26 December 2011. ↑ Press release (28 October 2003). "New Study Finds: 11,000 to 15,000 ਮਾਰੇ ਗਏ in Iraq War; 30 Percent are Non-Combatants; Death Toll Hurts Postwar Stability Efforts, Damages US Image Abroad". Project on Defense Alternatives (via Common Dreams NewsCenter). Retrieved 2 September 2010. Archived 17 October 2006 at the Wayback Machine. ↑ "Iraq Body Count". Retrieved 27 April 2014. ↑ Kim Gamel (23 April 2009). "AP Impact: Secret tally has 87,215 Iraqis dead". Fox News. Retrieved 26 April 2014.